We found the best place for babies to hang out and play!!! It's called Shane's Inspiration and its founders established Boundless Playground Resource Center West to assist other community groups with the development of these special playgrounds. 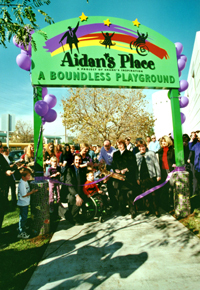 In partnership with the Department of Recreation and Parks, a second west coast boundless playground, AIDAN'S PLACE, was established at the Department's Westwood Park. Established for handicapped children, it's a great place for infants to crawl around! It's safe, spacious and surrounded by picnic benches, grass and many different age-specific recreation facilities. Check it out today.... you'll be so glad you found it!! Located on Sepulveda Blvd between Wilshire and Santa Monica Blvd in West Los Angeles, it's the place to be!